The breached notification site 'LeakedSource' which went offline in last January after the raids by official reports claim, now again came online. On the conversation on underground forums, it's been noticed that the new LeakedSource site is live with .RU domain. This new website, currently hosted at LeakedSource.ru, claims to be a continuation of the official LeakedSource service. The following statement was included on the newly launched website. Due to recent developments, we are required to switch server providers and domain name providers. Due to this unexpected course of events, we will be missing some content and we no longer have access to our old servers and old domain names, but we are working vigorously to restore LeakedSource to it's original glory. LeakedSource will now be running under the ccTLD .ru. Just as a reminder to all of our users, we take your privacy seriously. As such, we feel like it's our due deligence to inform you that we do not store personal information on our servers. Finally we'd like to thank you, the users and supporters, for your patience in this process. NOTE: Everyone will have to register again. NOTE: Every user will have to purchase a subscription again. NOTE: Businesses that used our API will have to purchase access to it again. "They were switching the server provider, and domain provider". 'decided it was for the best because we had at least one person from the team that left the project.' - they added. Regarding the unconfirmed FBI raids, the team had only the following to say: "As for the unconfirmed reports they are just speculations, so there isn't much to elaborate on it." At the meantime, LeakedSource.ru homepage counter shows 3,109,103,084 counts of breached accounts, which is exact same total indexed by the Wayback Machine in an archive of the original LeakedSource website taken on January 12. The original LeakedSource launched in late 2015, and it became known worldwide after it disclosed mega data breaches affecting services such as LinkedIn, MySpace, Dropbox, and many others. 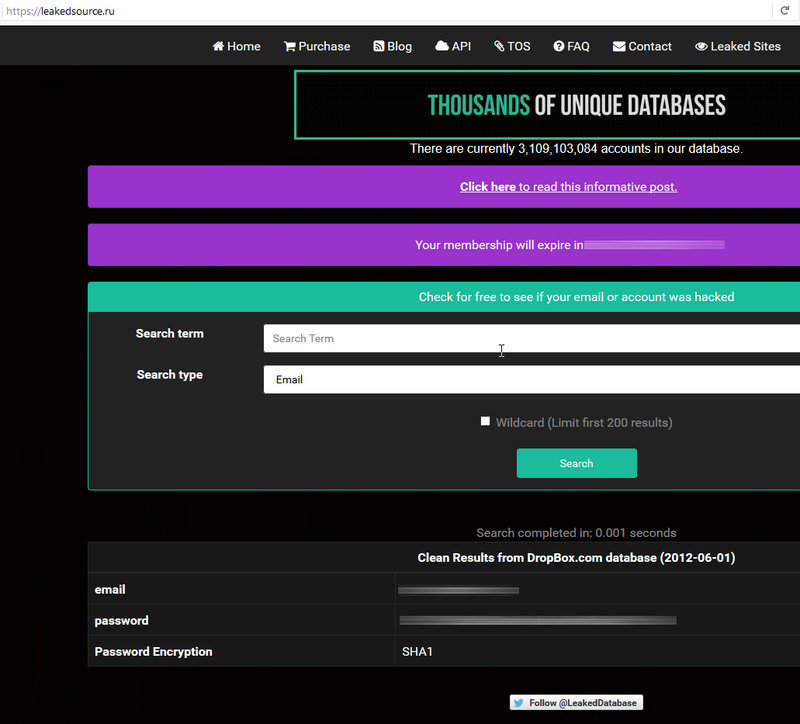 This may be a scam or phishing as original LeakedSource offers to view cracked password of the breached accounts in small amount as a premium member registration fee. There were many users who had purchased the premium member subscription, so as to grab or extortion of money Cyber crooks can come up new phishing. Till yet one of the users had confirmed that the site not a scam, but it is very much different from earlier LeakedSource. Users with an twitter handle @dotnet_sharp have shown Bleeping Computer in a private conversation, the service does list details from past data breaches.